Whether you love coffin bookcases or geek coffee tables, the living room is often the center of a house. It’s the place where families and visitors gather to talk, relax, and be entertained. The furnitures and decor in the living room can set the tone for everything that happens in that room. It follows that living room furniture is a main focus when a house is being decorated. If you’re anything but traditional, these unique and clever living room furniture designs may be right up your alley. See more in our collection of 90 Creative Urban Furniture Designs. Love fancy cars but can’t afford to keep a whole one around? How about just the back end? 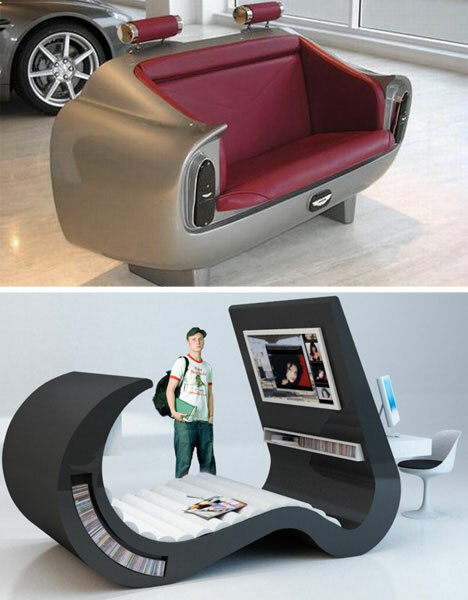 This car couch (top) is nothing like the tacky versions from the 80s. This is smooth, luxurious Aston Martin DB6 – just like James Bond would sit on if he ever sat around watching movies and eating potato chips. 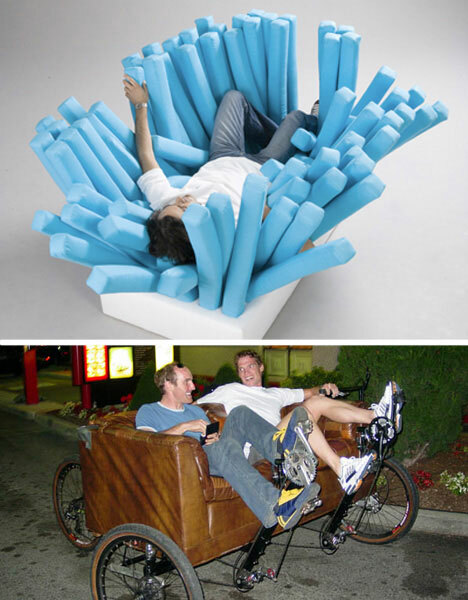 The Wave Chaise (bottom) is a new concept in teen seating/entertainment. This one piece of furniture contains everything your teenager (or you, if you’re game) might need entertainment-wise. Watch TV and movies, play video games, do homework, listen to CDs, read a book, talk on the phone or take a nap in this futuristic-looking pod. This odd looking piece of furniture (top) may have been inspired by a toothbrush. The long noodly arms look comforting, but we wonder how difficult it would be to play video games while constantly batting the soft arms out of your face. This piece is a concept designed by a student at Bucks New University. You may have heard of the world-famous motorized sofa. If you’re concerned about the environment and want to work out your calves without ever leaving your couch, the Couchbike gives you the best of all worlds. Although it’s not commercially available, its creators took it on a riding tour around the maritimes in Eastern Canada. The Meltdown Chair (top left) is a fine example of art doubling as a useful object. The artist, Tom Price, heats a chair form and presses it into a pile of clear PVC hose to melt and char the plastic. When it’s done, it looks like a chair with springy supports. 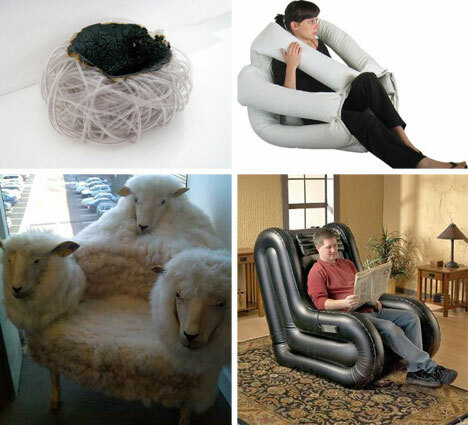 These may not be for everyone, but they do look oddly comfortable. When you feel like cuddling but you need to get some reading done, the Octopus chair (top right) has you covered. Literally. Made from recycled jeans and polystyrene balls, the many legs of the Octopus chair will keep you cozy and protected as you catch up on the latest thriller novel. Have your friends stopped answering your calls because they can’t stand to help you move all of your furniture into a new apartment yet again? Solve part of the problem with the inflatable massage chair (bottom right). It only weighs 18 pounds and can go from rolled up to fully inflated and ready to use in two minutes. Plus, what’s classier than an inflatable chair in your living room? 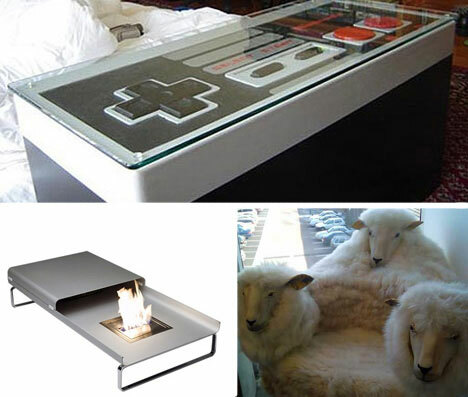 This sheep chair (bottom left) might take the trophy for classy living room furniture. With its three heads, soulful eyes and massive amounts of wool, this chair is part hellhound, part lambskin rug, and part really creepy throne. If you’re like us, you’ve probably said to yourself many times, “Hm, I could really do with an open flame in my living room.” Now, just for you, there’s a coffee table (top) that lets you not only keep an open flame near your flowing curtains, but grow grass at the same time. The Fire and Ice coffee table features a fire pit on one side and a cavity on the other side for storage or growing grass. A sliding metal platform only allows you to display one side at a time. The Cityscape (Dublin) table (top right) brings the Dublin skyline to mind while providing the perfect place to store your books and other oblong objects. 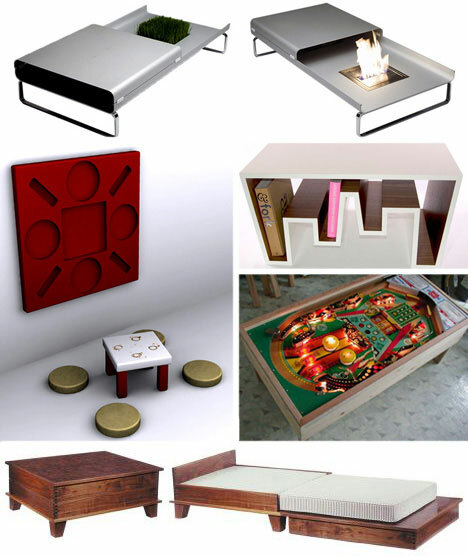 If you know someone who loves pinball, you can score major points in their book by making them this excellent pinball coffee table (bottom right). The idea of having an arcade machine that’s also everyday furniture is enough to thrill any geek. Convertible furniture is a great way to maximize the space in your living area. Most of us are used to seeing pull-out sofas for this purpose, but a pull-out coffee table (bottom)? That’s exactly what Julia West Home has done here. The result is a simple pull-out bed that you’d never know was there by looking at the closed-up coffee table. If it’s convertible furniture you’re interested in, take a good look at Fix it on the Wall Furniture (middle left) from designer John Nouanesing. When the furniture is not in use, each piece has its own place in the wall holder. When you need the tiny table and four cushions, simply pull them down, assemble, and enjoy your impromptu tea party. 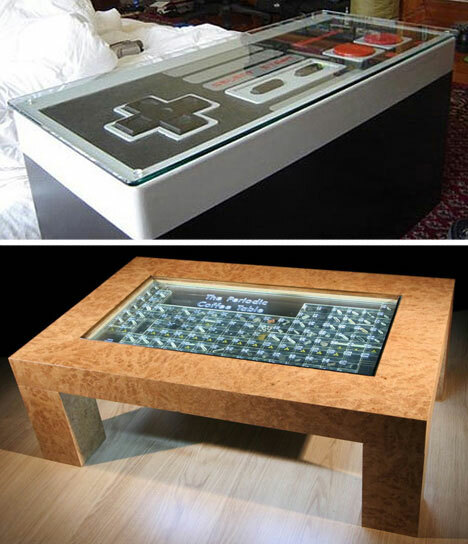 These coffee tables are for the true nerds among us. The top, a working Nintendo controller protected by a layer of glass, was truly a labor of love for its proud owner. The table on the bottom sports a feature that most of us instantly recognize: the periodic table of elements. Each element is represented by a small sample of it safely embedded in acrylic so that even the dangerous elements can’t hurt you. The design for these shelves is simply amazing. PLoP! 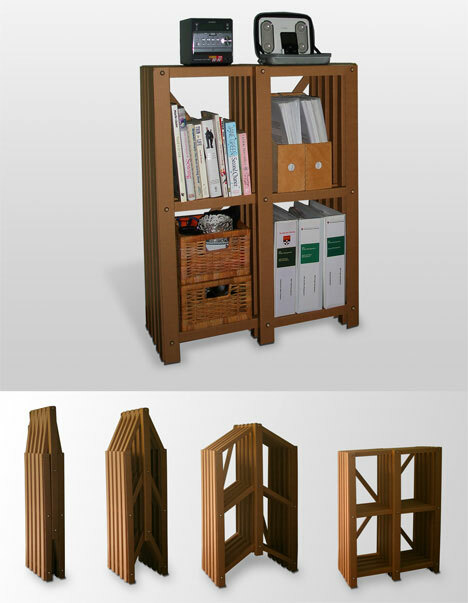 shelves are made of corrugated cardboard to make them easy to carry around and set up in a new place. The shelves are collapsible, so whenever you need to hit the road quickly you can just remove your things from the shelves and fold it up. 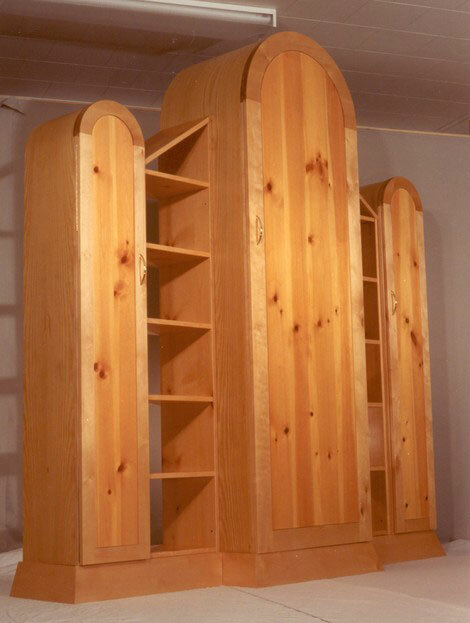 The units are also connectable, so you can have a long system of book shelves. Finally, the “Eternaltainment Center.” This company provides double-duty furniture that today can be used for any number of applications, but when the owner kicks the bucket the main part of the furniture becomes a casket. They sell everything, from sofas to display cases to pool tables, all made from your future coffin. Is it just us, or is that concept just a little weird? What’s your favorite piece of weird living room furniture? Let us know in the comments!